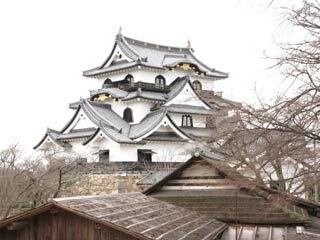 Hikone Castle (彦根城) is one of twelve castles that survive from the Sengoku period, and was chosen as a National Treasure of Japan. It was owned by the Ii family during the Edo period. The head of the Ii family was one of the four generals of Tokugawa Ieyasu. Not only the Tenshu (Keep) but also many features such as the gates, stone walls, and towers also still remain. Admission: 600 yen for adult, 200 yen. Hikone Castle originally stood on Mt. Sawa about 2 km to the northeast. Ishida Mitsunari, the lord of the castle, was defeated at the battle of Sekigahara and forfeited the castle in 1600. Ii Naomasa, a victor at that battle and one of the four most distinguished generals of the Tokugawa Allied Forces, was awarded the castle. Naomasa left Takasaki castle in Kozuke and moved into Sawayama Castle the following year. Later that year he attempted to move the castle to Iso mountain, about 3km north of Sawayama. However, he died in 1602 without realizing his dream. His son Naotsugu changed his father's plan and with the permission of Tokugawa Ieyasu, began to construct the castle in the current location. Even though Naotsugu received the cooperation of the Tokugawa Government and his fellow lords, the project took 20 years to complete. The main tower has been designated an Important Cultural Asset. The grounds have been designated a Special Place of Historical Interest. The beauty of Hikone Castle in the moonlight is well-known as one of the top eight scenic attractions of the Lake Biaw area. The three-story main castle tower. Though comparatively small in scale, the structure demonstrates the superior design required of a castle during periods of war. With its artistic arrangement of different roof styles, "Kirizuma-Hafu," "Irimoya-Hafu,""Kara-Hafu," elaborately designed windows, "Katomado" on the second and the third floors, and the balustrades or railings that surround the verandas on third floor make the external appearance spectacular. It is said to have originally been the main tower of Otsu Castle which was moved and reconstructed. Tsukimi Yagura - unfortunately, I don't understand a lot of what you are trying to say in the description for this part of the castle. ... is on the westnorth corner of Hisnihomaru which is next to Honmaru quarter. It has the turrets shaped an angle of obtuse on the east side and the north side each. Though this turret does not have decorative gables, whole of the building is plastered and simple grace.